For Detective Matt Buchanan, the world is a pretty sick place. He has probably been in the job too long, for one thing. And then there’s 14-year-old Samantha Coates, and the other unsolved murder cases. Those innocent girls he just can’t get out of his head. When Buchanan pursues some fresh leads, it soon becomes clear he’s on the trail of something big. As he pieces the horrific crimes together, Buchanan finds the very foundations of everything he once believed in start to crumble. He’s forced across that grey line that separates right and wrong – into places so dark, even he might not make it back. Matt Buchanan has worked on a series of horrific crimes spanning decades in an Auckland where it is always raining, and years on he is still haunted by his earliest case, the still unsolved disappearance of a school girl, Samantha. He is raising a teenaged girl of his own, after the death of his wife in a car crash, but still battles on while witnessing the worst abuse and violence that people are capable of. He does leave the force a couple of times when things get too bad – but he is drawn back when further atrocities occur and he becomes increasingly convinced that the string of abductions, sexual abuse and murder cases, and unidentified bodies are all linked. 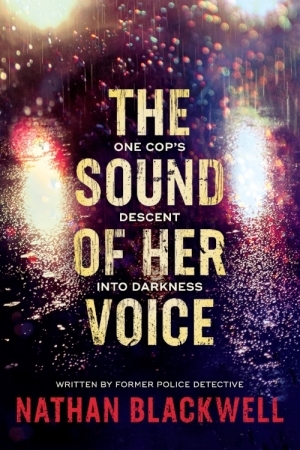 Nathan Blackwell is an ex-cop and The Sound of Her Voice is a police procedural, and when I saw it started with a glossary of Police jargon my heart sank – expecting the details of the ‘job’ to swamp the storyline. But this book is excellently plotted and totally riveting, the technicalities of the police work are seamlessly woven into the storytelling – the glossary is actually very useful! The only thing I found annoying in the writing was in the earlier parts of the book, where Buchanan has a total lack of imagination when it comes to swearing – both in his first-person narrative and in his dialogue, leading to repetitiveness. But this was a passing annoyance and quite overshadowed by the sensitivity of the scenes where Buchanan was dealing with the victims: a colleague dying in his arms, witnessing an autopsy, looking at the body of a young girl partially buried in a sand dune, even watching tapes of horrific abuse. The descriptions are genuinely moving and totally explain Buchanan’s commitment to achieving justice for the victims. And when justice might not be guaranteed within the system, he might just have to consider his options. Buchanan is a flawed hero – at one point Blackwell has him stumbling along beside a stream with just a compass to guide him – a lovely reference to his possibly losing his moral way. 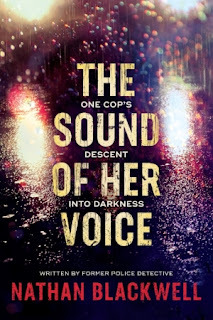 The Sound of Her Voice is an excellent piece of hardboiled fiction that seamlessly progresses to noir.